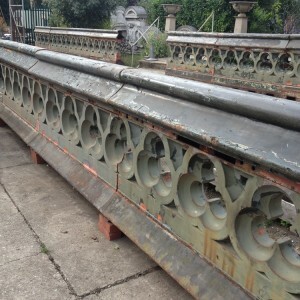 LASSCO is delighted to offer for sale the original Victorian Westminster Bridge that was removed during the extensive restoration works carried out in 1997 – the first time that an historic London river crossing has been offered on the open market since John Rennie’s Portland stone London Bridge of 1831 was sold by The Corporation of London to Robert P. McCulloch in 1968 – at 10,000tons undoubtedly the largest single item of architectural salvage ever shipped to the USA (That he thought he was buying Tower Bridge is a myth unfortunately!). To buy the bridge ironwork, please “Enquire” via the entry in our catalogue here. It is offered as a single consignment. Westminster Bridge, as depicted in works by Monet and many others – and countless films – was constructed during a sustained and intensive period of bridge building in London as the city boomed. Westminster Bridge has been the most long-lived of them – all others from this era have, in time, been superseded. The 300metre run of ironwork can be transported on 10 to 12 articulated truck loads.